I am working through the classes on Soul Food, and enjoying them. A fellow participant from Vienna commented that the classes were loosening her up from University, allowing her creativity to flow. It is certainly doing that for me. As an artist, I have my comfort zones, and explore my ideas within those zones. Sharing space or having artist friends, is a good way to learn techniques, but I have been working in a vacuum for a long time. These classes are teaching me new tricks. I get high checking in on the two groups I am part of, and seeing the wonderful pieces others are posting daily. Being in the groove, so to speak, is priming the pump. I saw my acupuncturist the other day (I’m a big baby about needles) and he was able to leave the needles in much longer because I was so preoccupied with a vision I had for some turtles to paint! 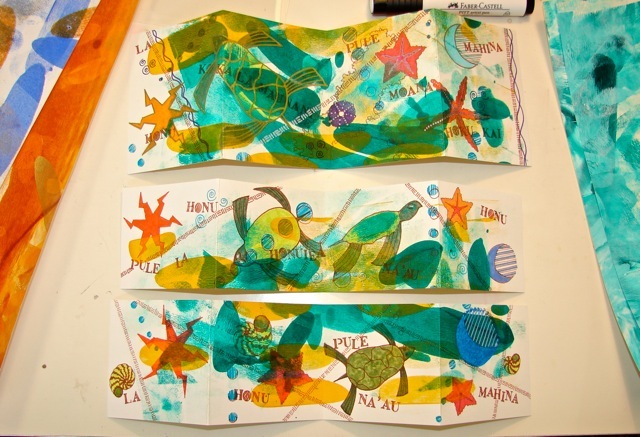 This morning Lisa Patencio offered a lovely video on a fun way to create a book-card. Being a notorious non-follower of the rules (thank goddess we are not being graded) I did it my way. I am on a honu-drawing kick, but did it in this style with some of her fun ideas and other tricks I have picked up. I love texture and random patterns, and working with a speed-ball roller to lay in color was a kick. I pulled out architectural templates and added some Hawaiian words appropriate to the the images, and off I went. I am learning to use Faber-Castell’s Pitt pens, and used them in tandem with Tombow pens, which I have used since college. I think I like Pitt’s better, mostly because the colors stay put, whereas Tombow is watercolor and will blend. It is all what I want for this time, now. I wish Pitt had more colors for the fine tips (versus brushes), especially in the white — I LOVE the white india ink. To be able to come back and do this or that and use white as a color is lovely. I am sure that if I had a skinny nib I would do color on black with white as a reverse ink. I started with a sheet of 100lb watercolor paper, 11×14-inches. I added Golden liquid acrylic color with the roller, then played with my templates to locate the words I wanted in the pieces. Then I cut them into the lengths, and began detailing the book-cards. I loved the way the ink went darker over the plain paper then textured into a lighter hue over the acrylic. Process above, on my first one, which was the trial. Details below. These are already spoken for; setting them aside for friends birthdays! 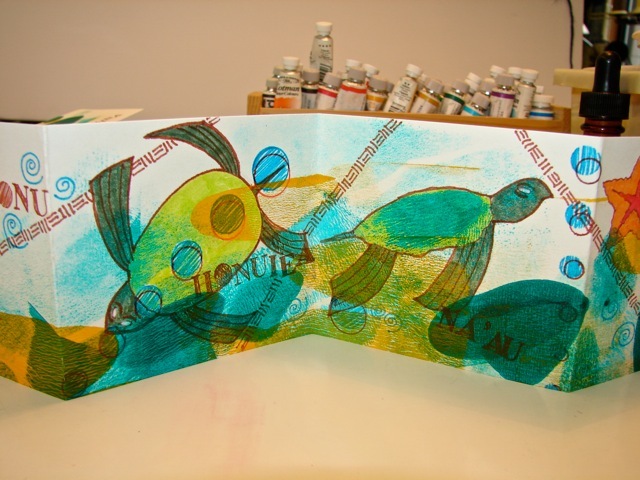 This entry was posted in acrylic, art, creativity, process and tagged folded cards, Soul Food. Bookmark the permalink.